As the late summer heats up and you return from your vacay pink with sunburn, can I suggest a great, completely family friendly, very zen show to binge watch? 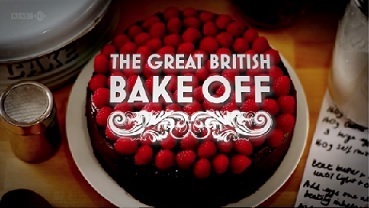 Check out the Great British Baking Show. It was recommended by one of my favorite podcasts, Pop Culture Happy Hour. It plays on PBS and you can catch at least one past season on Netflix. It's the most un-reality-show-ish reality show, and is full of awesome English vocabulary. For example, one episode recap was, "The competition continues with a "saucy puds" bake-off, a tiramisu technical challenge and a heated showstopper round featuring baked Alaska." What's not to love about that? The Nerdist with Paul Dini. I wasn't familiar with Paul Dini (if you love animation and comic books you might know of him). About 20 minutes into the pod cast he described a life changing event, a personal tragedy. He said, "You can either be the hero or the villain, you need to chose which to be." Water Color from The Moth. A man's story of being underestimated at Boy Scout Camp. Speeding to Bible Study from The Moth. A rabbi's hilarious encounter with the police. The Curse from the Moth. This story is amazing and contains one of my favorite lines, "The difference between a smart person and me is that they read a book that I haven't." Indeed. If you feel behind because you are the only human on earth not playing Pokemon Go, here is a quick overview from Pop Culture Happy Hour that is helpful. One last recommendation - a book! I put The Rosie Project on the inaugural GIB Book List. I read the sequel, The Rosie Effect, and it's equally awesome!